When Ella discovers her Wall Street banker boyfriend is renting a secret storage unit, she suspects he’s using it to hide an affair. Enlisting the help of her best friend Molly she breaks into the facility only to discover something more terrifying instead. Now trapped in a darkened building with a group of neurotic strangers who start disappearing one by one, Ella soon uncovers even worse horror in the dank depths. It’s safe to skip “The Hoarder“. You won’t miss much. Despite the original concept, regarding the used location, it’s still a deplorable lousy film. For the simple reason that there’s hardly anything happening the whole movie. It really isn’t exciting or tense. For the umpteenth time it’s about a number of individuals being trapped and chased by a murderous creature. In the end, you’ll know what it’s about and where the creature comes from. But it isn’t really impressive. And since it’s a horror, you would expect some bloody scenes. Don’t keep your hopes up. When someone is being murdered, it all happens out of view most of the time. Probably the low budget has something to do with it. As I mentioned earlier, the location where everything happens is quite unique. It all starts the night Ella (Mischa Barton) has doubts about the sincerity of her fiancé. At once she gets this brilliant idea to go to the building where her fiancé hires a storage unit together with her best friend Molly (Emily Attack. What’s in a name). Isn’t it fascinating? How does she know he’s hiding a diary there among other rubbish? This item could bring solace about the past of her fiance. Unfortunately it’s not only someone else’s mess, full of nostalgia and secrets hidden for the outside world, which is stored here. There are other things on a secret floor where those two cows end up in despite the security measures. And as always, thanks to those two ladies, trouble lurks around the corner. Before they know it, they are stuck in the building along with several other strangers, and are attacked by a nasty-looking creature with a stitched mouth. All in all, the beginning was promising. It wasn’t as if I was watching a low-budget film. And honestly, the performances of Barton and Attack weren’t so bad. And the moment Robert Knepper turned up, in the shape of the serving policeman Vince, things became more interesting. He looked familiar to me (I’ve probably seen him in some kind of television program). What pleased me the most was the fact that they didn’t create for the umpteenth time a group with those typical archetypes (such as the sporty hunk and his blonde bimbo, a nerd, a Goth-chick …). It’s a heterogeneous group consisting of regular, everyday people who stored their belongings in that building. Most commendable interpretation was provided by Andrew Buckley as the not so athletically looking Stephen, who runs the place. What annoyed me the most, was the building and its facilities. It looked like Fort Knox with that high-tech security and immaculate corridors. It resembled a modern atomic shelter. But how old were those elevators? Guess the designers of this ultramodern building tried to save some money apparently. And the firm responsible for the installation of the lighting, probably was the cheapest alternative. I’m sure an amateur delivered that work. The designer of this lighting automatically deserves a slap in the face with a fluorescent tube. And finally, some of the performances were appalling bad. Also, when it comes to the conversations, the timing was really strange sometimes. A non-human killer wanders through the corridors, but they need to argue about a failed marriage and money issues. Weird. 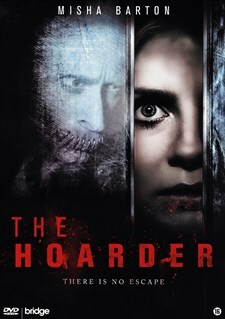 “The Hoarder” certainly isn’t an awfully bad film, but it wasn’t really impressive either. Even the final denouement wasn’t captivating enough. The claustrophobic setting and the threat of the stapled being didn’t create any discomfort or tension. And the film is packed with illogical situations. Apparently, sweeping an electronic card a few times, is sufficient enough to make it work eventhough it’s not the right card. The only thing I thought in the end was : “Ah, that’s what’s happening“. Not more and not less. So don’t expect an astonishing denouement or twist. Believe me, it’s not mandatory to watch “The Hoarder“.